Happy Monday, friends! 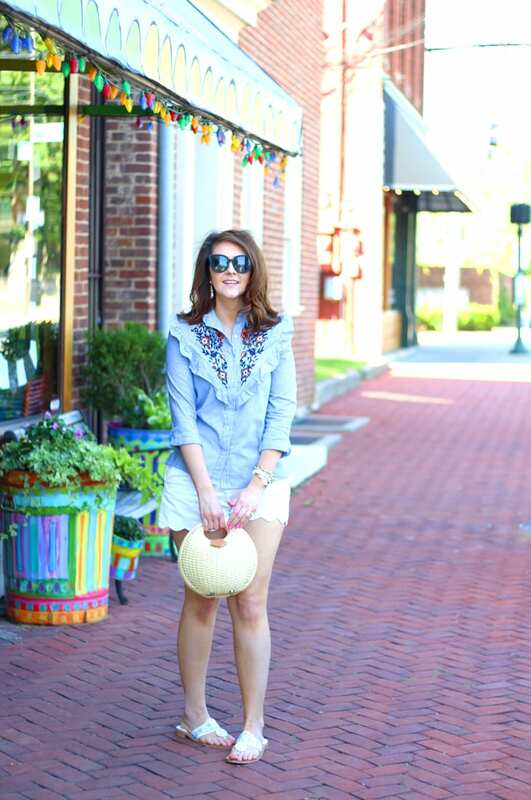 Today I’m sharing this dressy casual summer outfit. If you haven’t checked out the epic blogger brunch I attended at The Barn at Springhouse this weekend, however, then head to my Instagram stories or checkout the video on my Facebook page (give my page a like while you’re there! )–it seriously was Pinterest perfect! 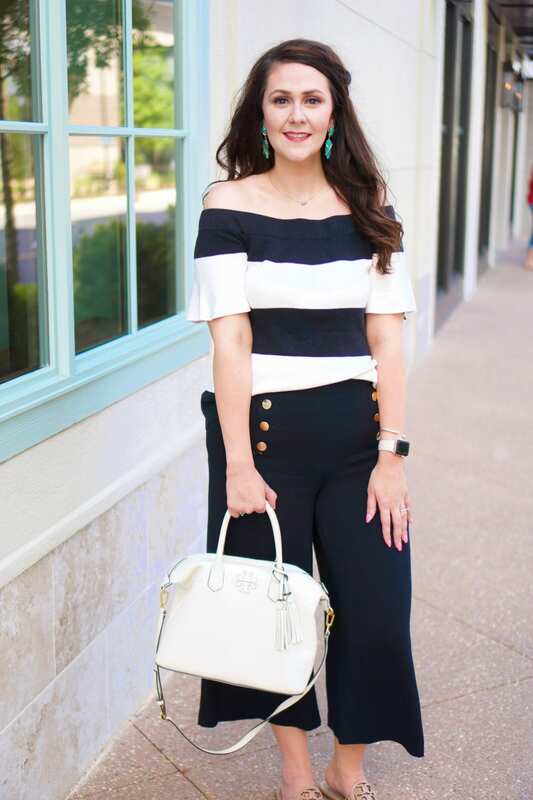 If you follow along on Instagram, then you know I wore this outfit out to dinner last weekend at one of my favorite restaurants here in Lexington, Joe B’s. 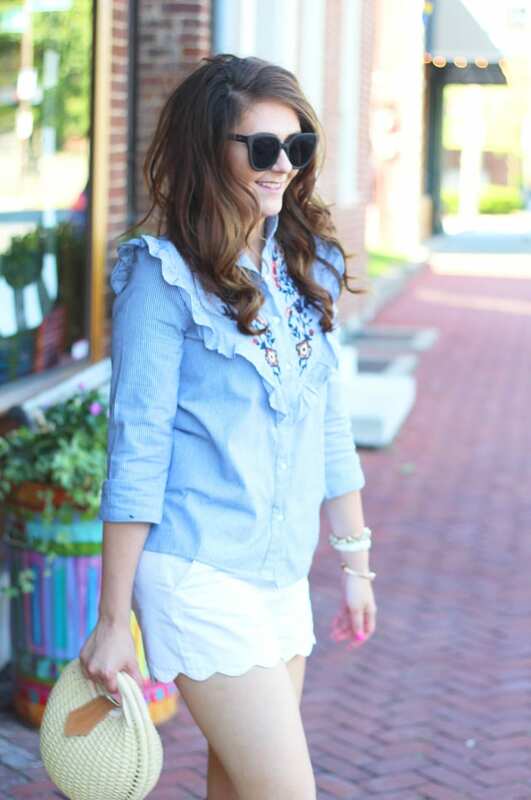 I love how it’s dressy yet casual when paired with these scalloped shorts. I’m loving the pinafore-style top. The ruffles extend to the back of the top. Yes, it’s a little bit Little House on the Prairie, but I adore this style. I actually ordered a similar top that should be in soon. 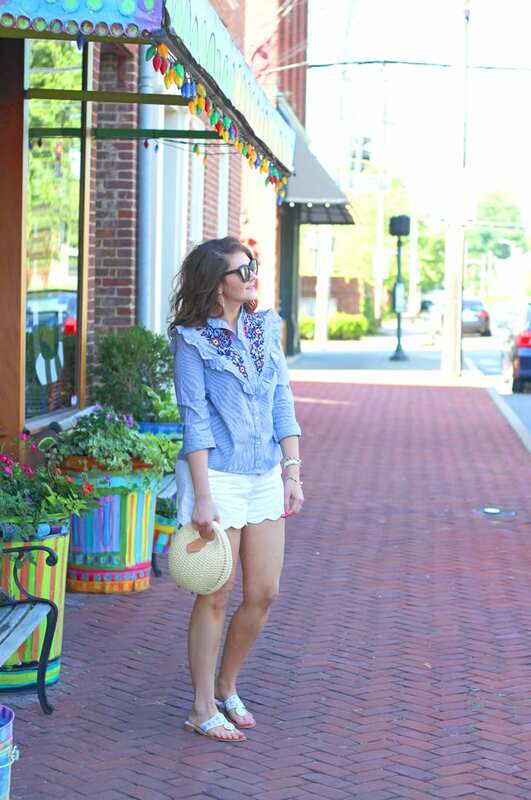 And if you don’t have a pair of white scalloped shorts yet, you need a pair. I have reached for these and my white jeans so much this summer because they go with everything. I just got these earrings in the mail from Sugarfix–I love the gold filigree style and the blush tassels. Also, an identical pair of earrings are still on the Baublebar website for much more. These babies are only $12.99!!! I’m so glad I snagged these Jack Rogers from Draper James! These sandals are the epitome of Southern summers. I had serious FOMO so I had to buy them. THey also come in a pink seersucker pattern. The rest of my outfit is simple, with my summer accessories staples that I’ve worn in almost every blog post for the last month and a half. When buying accessories, be sure to look for great neutrals, like my handbag and my watch, that you can wear with everything!!! You look so cute and so does the place behind you! This bag was such a good buy; it goes with so many of your summer outfits! Perfect comfy hot weather look. The top is just darling! 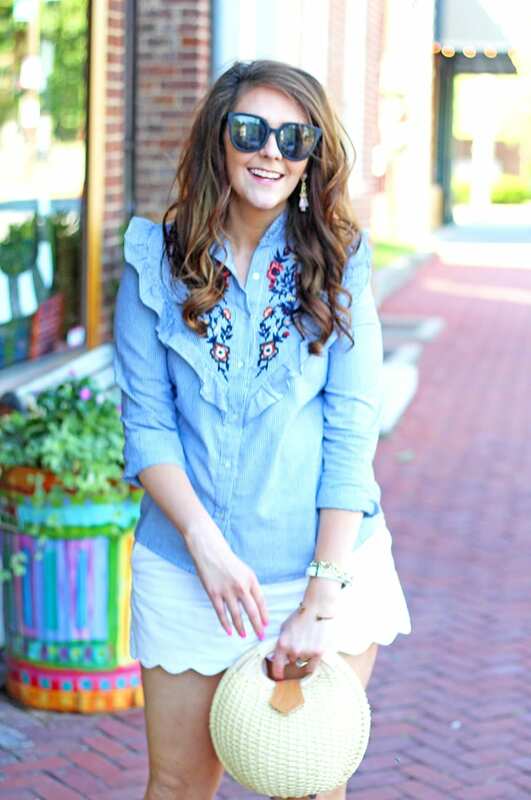 That top is the cutest with the embroidery and ruffle! I love your bag! 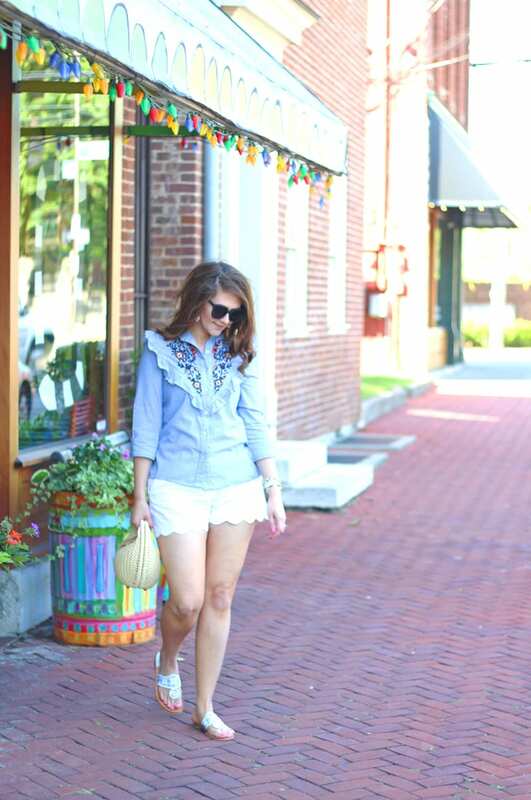 The embroidery and scallop shorts are such a fun combo. 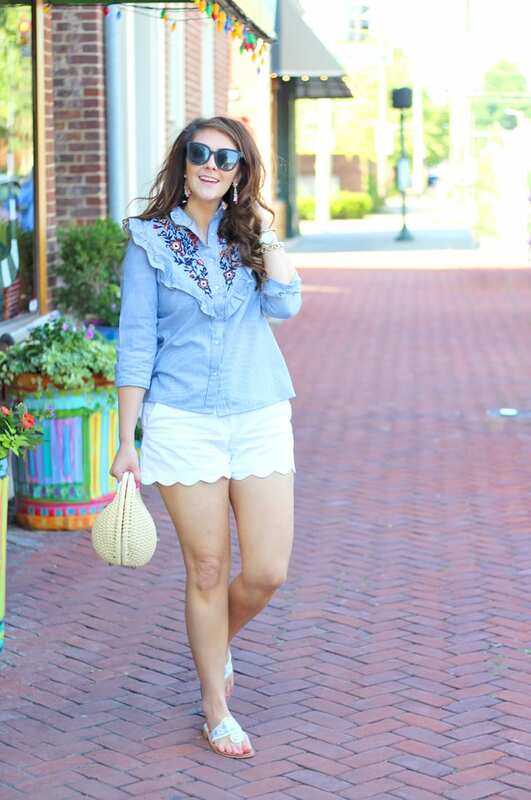 Love the scalloped shorts and the top is just so cute! 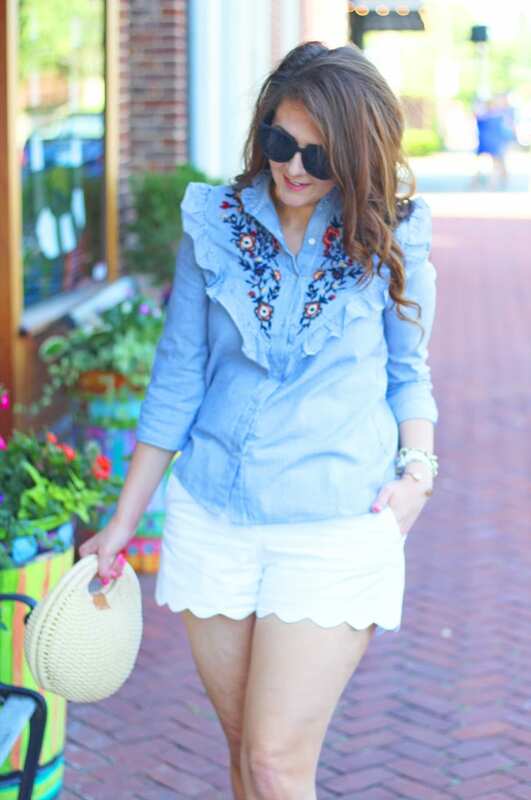 I love the scalloped shorts! They are so simple and cute! I love the embroidered details on this top. So pretty! 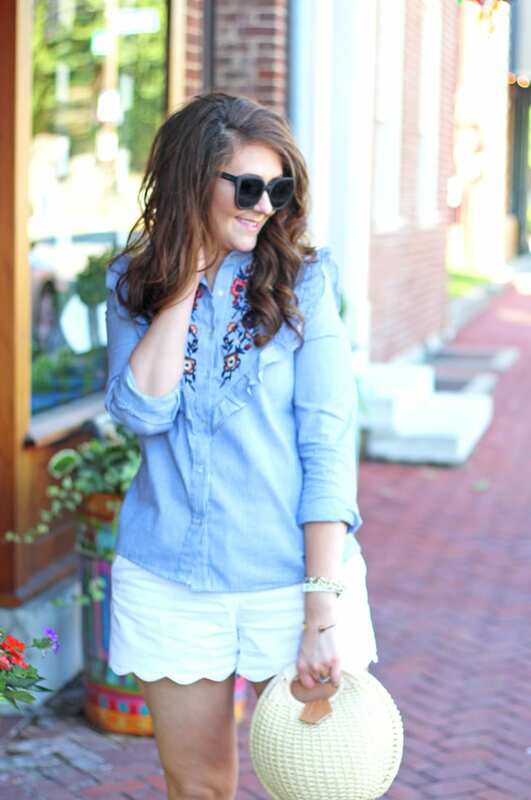 Thanks for joining in on the Style File Link up today! What a fun look! 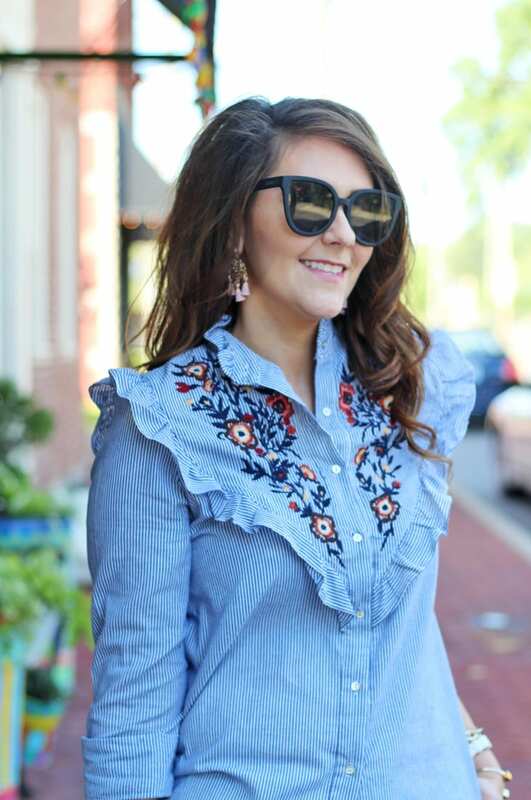 I love those ruffled, embroidered pieces! This look is so fun! Love your bag! 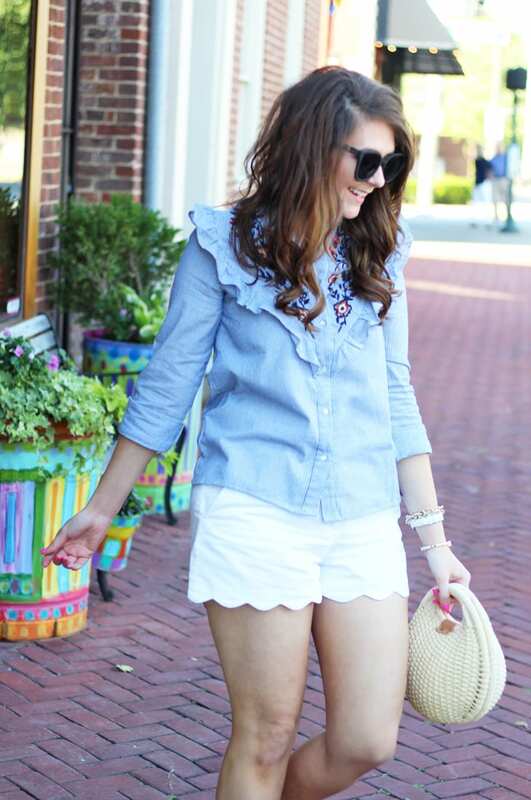 Love the scalloped shorts, so darling! Love the shirt and your little bag! Love it!